When running wires and cables across a floor in high-traffic or conspicuous areas, keep them out of sight and protected from damage by pulling them through overfloor raceways. 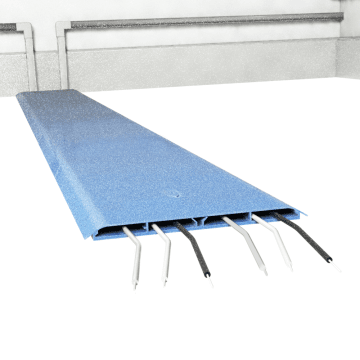 The raceways' wide, low profile and sturdy yet flexible construction shields wires and cables from foot traffic, wheels, and casters without getting in the way. Typically used to bring power, data, voice, or audio/visual cables from a wall to a desk or conference room table.